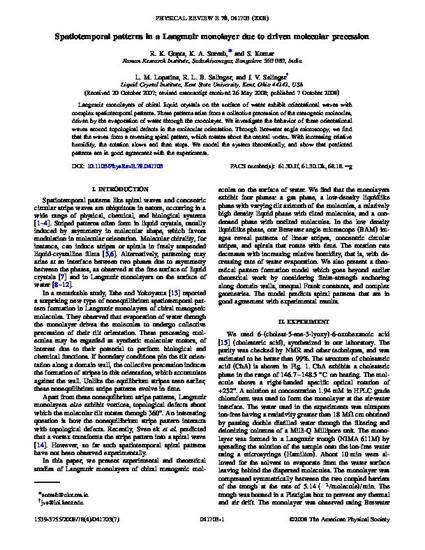 Langmuir monolayers of chiral liquid crystals on the surface of water exhibit orientational waves with complex spatiotemporal patterns. These patterns arise from a collective precession of the mesogenic molecules, driven by the evaporation of water through the monolayer. We investigate the behavior of these orientational waves around topological defects in the molecular orientation. Through Brewster angle microscopy, we find that the waves form a reversing spiral pattern, which rotates about the central vortex. With increasing relative humidity, the rotation slows and then stops. We model the system theoretically, and show that predicted patterns are in good agreement with the experiments. Copyright 1992 American Institute of Physics. This article may be downloaded for personal use only. Any other use requires prior permission of the author and the American Institute of Physics. The following article appeared in J. Appl. Phys. 71, 664 (1992).